The rally took place in Newark, New Jersey, Booker's adopted hometown, where he built a national profile as mayor from 2006 to 2013 before winning a Senate seat. The event, which kicked off a two-week "Justice for All" multistate campaign tour, comes as Booker, 49, remains wedged in the middle of a crowded pack of Democratic hopefuls. Booker's 30-minute speech relied on some of the same themes of unity and compassion that he has touted throughout his campaign, arguing that defeating U.S. President Donald Trump in 2020 will require an inclusive approach to combat the Republican chief executive's often no-holds-barred brand of politics. "We have to decide whether we will choose division and blame - or if we will do the hard work of conquering fear with faith, apathy with action, and hatred with love," Booker said. "The president wants a race to the gutter and to fight us in the gutter. To win, we have to fight from higher ground in order to bring this country to higher ground." Booker also laid out a specific liberal policy vision, even as he warned that Democratic voters should favor pragmatism over ideological purity. He vowed to pursue Medicare-for-all, legalize marijuana, end mass incarceration and create "baby bonds" - government-backed savings accounts designed to close the racial wealth gap. "You've got to organize and got to get hot at the end," Booker's campaign manager, Addisu Demissie, told reporters on Thursday. "We're not building this campaign to win polls in April 2019. This is a long race and there are going to be a lot of ups and downs." 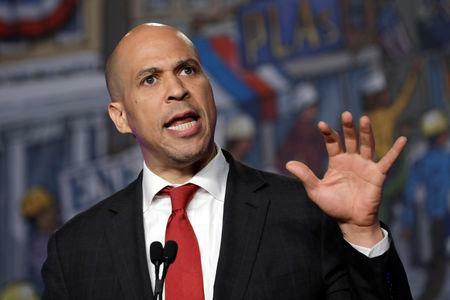 Booker sought to connect his call to action on Saturday with the civil rights movement, noting that the date of the rally, April 13, was the same day that Martin Luther King Jr began writing his famous "Letter from Birmingham Jail" while sitting in an Alabama cell in 1963. "He spoke to the possibility of what we can achieve when we realize our own power and refuse to wait," Booker said. "America, we know our history - it is a perpetual testimony to impatient, demanding, unrelenting people who in every generation with love stood up for justice."